Dirty water from Queensland’s historic flooding, triggered by weeks of exceptional monsoon rains earlier in the year. Australian summers are getting hotter. Today marks the end of our warmest summer on record, setting new national temperature records. Worsening drought, locally significant flooding, damaging bushfires, and heatwaves capped a summer of extremes. As we look to autumn, warmer temperatures overall and below average rainfall – especially in eastern parts of the country – are likely. Australian summer mean temperature anomalies against the 1961–1990 average. The starkest feature of this summer was the record warmth. The national average temperature is expected to be about 2.1℃ above average, and will easily beat the previous record high set in summer 2012-13 (which was 1.28℃ warmer than average). Very low rainfall accompanied the record heat of summer. At the national scale, each month was notably dry, and total summer rainfall was around 30% below average; the lowest for summer since 1982–83. The monsoon onset was delayed in Darwin until the 23rd of January (the latest since 1972–73) and typical monsoonal weather was absent for most of summer. Preliminary summer 2018–19 mean temperature deciles. In December 2018 Australia saw its highest mean, maximum and minimum temperatures on record (monthly averages, compared to all other Decembers). Notable heatwaves affected the north of Australia at the start of the month, spreading to the west and south during the second half of December. Temperatures peaked at 49.3℃ at Marble Bar in Western Australia on the 27th, with mid-to-high 40s extending over larger areas. The heat continued into January, which set a national monthly mean temperature record at 2.91℃ above the 1961–1990 average. Heatwave conditions which had emerged in December persisted, with a prolonged warm spell and numerous records set. Eight of the ten hottest days for the nation occurred during the month, while a minimum temperature of 36.6℃ at Wanaaring (Borrona Downs) in western New South Wales on the 26th set a new national minimum temperature record. Temperatures moderated a little in the east of the country for February, partly in response to flooding rainfall in tropical Queensland. Even so, the national mean temperature will come in around 1.4℃ above average, making this February likely to be the fourth or fifth warmest on record. Australia has seen dry summers before and many of these have been notably hot. The summers of 1972–73 and 1982–83 – which featured mean temperatures 0.90℃ and 0.92℃ above average, respectively – both came during the latter stages of significant droughts, and were both records at the time. As the State of the Climate 2018 report outlines, Australia has warmed by just over 1℃ since 1910, with most warming occurring since 1950. This warming means global and Australian climate variability sits on top of a higher average temperature, which explains why 2018-19 was warmer again. A major rain event affected tropical Queensland during late January to early February, associated with a slow-moving monsoonal low. Some sites had a year’s worth of rain in a two-week period, including Townsville Airport which had 1,257mm in ten days. Many Queenslanders affected by this monsoonal low went from drought conditions to floods in a matter of days. Flooding was severe and continues to affect rivers near the Gulf of Carpentaria, as well as some inland rivers which flow towards Kati Thanda–Lake Eyre. Preliminary summer 2018–19 rainfall deciles. Spring 2018 saw a positive Indian Ocean Dipole which faded in early summer. At the start of summer sea surface temperature anomalies in the central Pacific exceeded 0.8℃, which is the typical threshold for El Niño affecting the oceans, but these declined as summer progressed. Combined with a lack of coupling between the atmosphere and ocean, the El Niño–Southern Oscillation remained neutral, though normal rainfall patterns shifted to oceans to the north and east, leaving Australia drier as a result. As we move into autumn, the El Niño–Southern Oscillation and Indian Ocean Dipole tend to have less influence at this time of year. The onset of new Indian Ocean Dipole or El Niño/La Niña events typically happens in late autumn or winter/spring. Over recent years, autumn rainfall has also become less reliable, with declines in cool season rainfall in the southeast and southwest. Temperatures are also rising, in a local expression of the global warming trend. The Bureau’s outlook for autumn shows high probabilities that day and night-time temperatures will remain above average for most of the country. We expect to see continued below-average rainfall in much of the east, where drought is currently widespread. Looking to the winter, the Bureau’s ENSO Wrap-Up suggests the Pacific Ocean is likely to remain warmer than average. The potential for an El Niño remains, with approximately a 50% chance of El Niño developing during the southern hemisphere autumn or winter, twice the normal likelihood. Rainfall outlook for autumn 2019. For more information watch BOM’s March–May 2019 Climate and Water Outlook video and subscribe to receive Climate Information emails. It’s the same old story: with 2016 on track to become the hottest year on record globally, and record-breaking heat already evident around the world, Australia has just experienced its hottest autumn on record. Figures from the Bureau of Meteorology indicate Australia has experienced its hottest autumn on record. 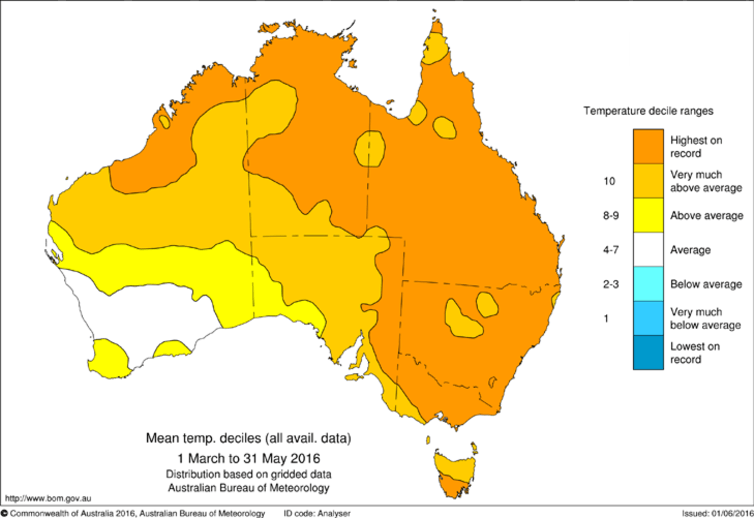 The Bureau of Meteorology has reported that for average temperatures across Australia, this has been the hottest March-May period ever recorded – beating the previous record, set in 2005, by more than 0.2℃. Within this period, March was also the hottest on record, while April and May were each the second-warmest in a series extending back to 1910. Temperatures were well above average across much of the country, especially in the east. El Niño events tend to cause warmer weather across the east and north of Australia and the major El Niño of 2015-16 undoubtedly contributed to the extreme temperatures experienced across these areas. However, climate change also played a significant role in our warmest autumn. Previous work, led by ANU climatologist Sophie Lewis, indicates that the human influence on the climate has made a record-breakingly hot autumn roughly 20 times more likely. 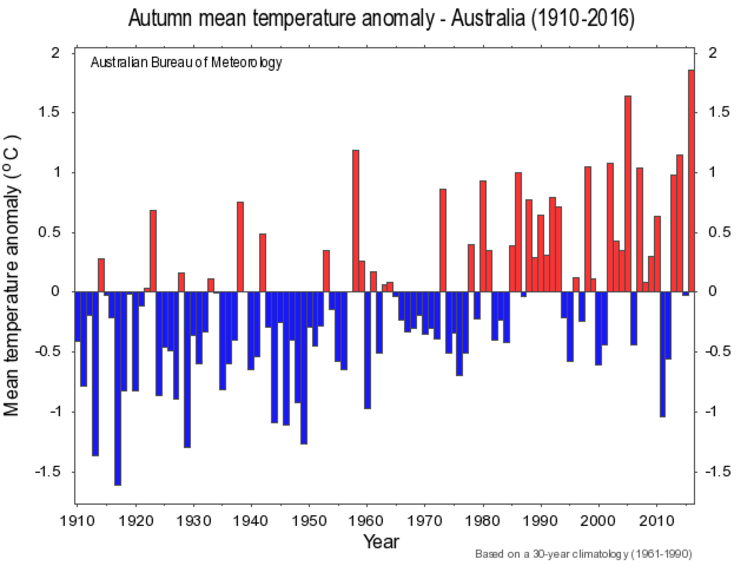 In other words, without climate change we would be much less likely to experience autumns as warm as this one has been in Australia. In the past few months, Australia has seen many extreme hot weather events. Melbourne experienced its warmest March night on record, while Sydney had a run of 39 days with daytime highs above 26℃, as the summer heat continued long into March. But it’s the coral bleaching event on the Great Barrier Reef that will likely linger in our memories the longest. Some 93% of the reef was found to be affected by bleaching and recent surveys have revealed that more than one-third of coral in the northern and central parts of the reef have died. Without climate change, a bleaching event like this would be virtually impossible. The extreme heat over Australia this autumn and the associated damage to the reef are also having an effect on the election campaign. As public concern over the future of the reef grows, the parties are being asked to defend their climate change policies. Both major parties have made election commitments to the reef, with the Coalition announcing an extra A$6 million to tackle crown-of-thorns starfish (adding to a further A$171 million committed under the 2016 budget), and Labor an extra A$377 million over five years (A$500 million in total). While both Labor and the Coalition aim to improve water quality in the reef through their policies, the coral bleaching and death this year is linked with warm seas. Whether we’ll be able to save parts of the reef largely depends on whether we reduce our greenhouse gas emissions and manage to prevent the rising trend in temperatures from continuing.